Blue Sargent lives in a family of psychics, though she has no (usable) magic herself. She’s been told since early childhood that if she kisses her true love, he will die, and therefore, she’s decided never to fall in love. Her fate, however, can not be outrun, and on St. Mark’s Day in her sixteenth year, Blue sees one of the soon-to-be dead: an Aglionby student, a Raven Boy, named Gansey. She shouldn’t see the dead – she has no magic – and the fact that she sees him means that she’s his true love, or she’ll be the one to kill him. Or both. A couple years ago, I tried to read this book. The premise was interesting, and I loved that first creepy scene in the abandoned churchyard on St. Mark’s Day. Then I got to Chapter 2, where we meet Gansey and several of his friends, and I lost interest completely. They seemed completely typical of YA stereotyped male protagonists, and I didn’t want to spend any time on them. Recently, however, I heard Memory talking about how great this book is, this series is, and I thought hey, I might as well give it another chance during RIP season. 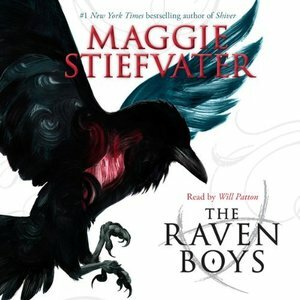 And, because I’m generally more tolerant of books in audio format, I checked out the audiobook from my library. So, so glad I did. Funny thing is, I got to Chapter 2 and had all those same thoughts about Gansey et al. But it was an audiobook, so I kept listening. (See? More tolerant.) After that moment, things got better. Much, much better. So much better, in fact, that I spent the better part of two days finding reasons to get up and walk, work, drive, whatever would allow me to keep listening. Gansey, Ronan, Noah, and Adam grew into real people instead of just caricatures. Blue was fantastic, and watching her interact with these boys who came from a completely different world was priceless. (Especially the first time she and Gansey meet.) The paranormal parts were deliciously creepy, the twists caught me by surprise, and the story ended with enough closure to feel satisfied, but also enough left hanging to make me want to read more. Yes, I’ve already checked the next audiobook out from the library. I think what I liked best about the book, though, is that it wasn’t just a ghost story. It touched on what it’s like to grow up in an abusive household and to know you’ll be homeless if you speak up. It discussed family and what truly makes up that word. It showed the agony of not knowing when something might go irrevocably wrong, after having lived through the nightmare once already. Sometimes, Gansey felt like his life was made up of a dozen hours that he could never forget. Stiefvater does all this without shoving any of the issues into your face. They are simply part of the fabric that makes up the characters’ lives, and in my opinion, that’s the very best way to approach heavy subjects. I was impressed, and now very much looking forward to The Dream Thieves. Performance: This audiobook was read by Will Patton. Despite heavy dialectical accents – generally something I dislike in audiobooks – I enjoyed the performance and thought it was well done. Each character was distinct and recognizable, and I particularly liked the parts when more than one voice spoke at a time. Not something I’m used to in a single-cast audiobook. This entry was posted in 2014, 2015, 2017, Prose, Young Adult and tagged audio, favorite, humor, memorable, multi-read, reread, RIP-worthy, speculative. Bookmark the permalink. Yayyyyyyy more people for the Maggie Stiefvater bandwagon! So, so pleased you liked this! It was a conversation between you and Memory and Ana, I think, that got me to try it again. I remember talking to Memory about it specifically, but couldn’t remember who else exactly was in the twitter-convo. Thanks y’all!! !